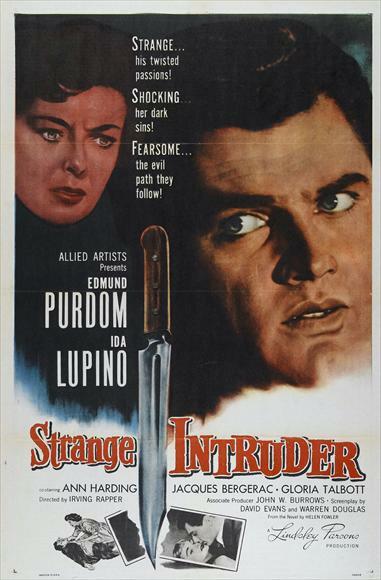 British actor Edmund Purdon is Strange Intruder Paul Quentin in this 1956 psychological thriller from director Irving Rapper (Now, Voyager). Paul is a survivor of a POW camp during the Korean war. While in the camp, he meets and befriends Dr. Adrian Carmichael (Donald Murphy). The two pass the time by talking about Dr. Carmichael’s life and family back home. Dr. Carmichael reminisces on his home life so fondly that Paul feels like he knows the family himself. But when Dr. Carmichael is killed at the camp, their friendship takes a turn for the sinister. On his deathbed, Dr. Carmichael says he’d rather the children die than live with a stepfather. He is sure his wife Alice (Ida Lupino), who confessed to cheating on him in the final letter that he received from her before all contact to him was cut off at the POW camp, will pick up a new husband fairly quickly. Flash forward a bit, and Paul is back in the states, having survived the war. He’s been held in a hospital, where he is told that they’ve done all they can do for him in terms of therapy, and he must start putting in effort on his own to become a functioning member of society again. Haunted by his friend’s death and dealing with deep mental wounds, Paul begins to take Dr. Carmichael’s deathbed statement very literally, and decides that upon his release from the hospital he must exact revenge on the unfaithful Mrs. Carmichael by killing her children. 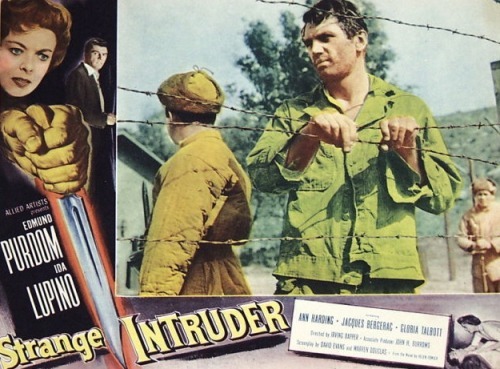 The film begins in the POW camp, bringing the audience back to America in a little over ten minutes. While in the POW camp, the film very distinctly sets Dr. Carmichael up as a man more than worthy of Paul’s grief and protection. Dr. Carmichael does all that he can to keep his fellow men alive, despite the fact that he does not have access to medical supplies and will surely suffer the consequences of disobeying his captors’ orders. He seems a very noble man, and as a result the audience can see why Paul would feel so protective of his memory and legacy. A very good amount of suspense is also built in the POW camp, as the men contend with their captors’ demands while trying to stick together and survive air raid attacks. In America, with Paul being released from the hospital, the film definitely takes on a whole new kind of suspense. Eerie narration from the deceased Dr. Carmichael explicitly shows the audience the extent of Paul’s mental condition. It’s almost as though he’s been possessed and lost control of his own mind. He hears that voice and is willing to do whatever it tells him, without question. The suspense is not quite as high as it could be here, and the narration is a bit gimmicky, but Purdon somehow succeeds in making it seem quite believable. True suspense does soon begin to build, getting better and better as the film draws to a close but never quite reaching its potential. A more effective sense of danger and fright could have been built, had the script been a bit more believable. Purdon is fantastic in his role, but it’s very hard to believe that nobody in Dr. Carmichael’s hometown would take issue with his strange behavior and begin to suspect that he was up to something. The actors who fill these hometown character roles are convincing despite the outlandish nature of the script, but with the audience wanting to jump in the screen and ask them, “Can’t you see what a creep this guy is?,” it all seems a bit too movie-like rather than life-like. If you’re going to go the “characters as dumb as a rock, can’t see the danger in front of them” route with the horror film, you’d be better off running with that and venturing into the always lovable “so bad it’s good” category of horror/thriller films. But this one doesn’t do that — it borders on that territory, while also trying to take itself very seriously. Next Next post: Through the Library: The Final Five!